His Royal Highness Prince Charles delighted crowds to unveil the Gold Coast Commonwealth Walkway today at Kurrawa Beach, Queensland. Prince Charles was accompanied by HRH The Duchess of Cornwall and was invited to unveil the panel promoting the 10km route by The Mayor, His Worship Tom Tate. The Outdoor Trust was represented by Lord Marland, Chairman of the Commonwealth Enterprise and Business Council, who also kindly took the Commonwealth Banner to the Gold Coast, the same one recently used in Scotland and Canada to launch their Walkways. The Gold Coast is the first Australian city to open a walkway and are promoting the route as a great way to discover the city, offering an insight into the heritage of the Gold Coast, starting at the historic Southport Chambers, and finishing at City of Gold Coast Council Chambers. 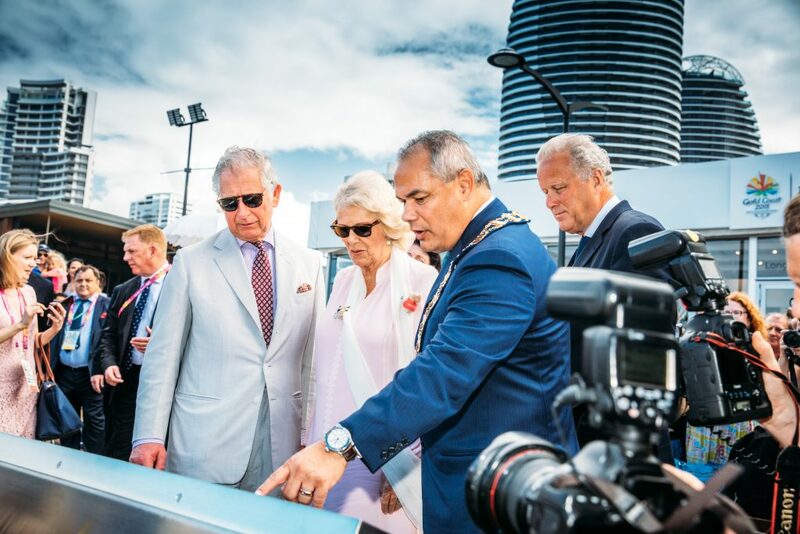 The new Walkway was recognised by The Mayor as a lasting legacy of the Gold Coast 2018 Commonwealth Games, which were officially opened yesterday by HRH Prince Charles on behalf of Her Majesty The Queen. The walkway is an insightful and scenic discovery trail, with walkers encouraged to complete a passport along the way, based on 37 bronze markers located along sections of the walk. Each marker includes a piece of history about the city, or marks a place of interest, and inside the passport is a question about each location. Highlights of the walkway include our Indigenous heritage, the Aquatic Centre, our bikini history and the Cultural Precinct – which is now being built; the Captain James Cook Memorial, ANZAC Park, Surfers Paradise Foreshore, Chevron Island Bridge and St Margaret’s Chapel. Walkway passports are now available at every Customer Service Centre. Walkers are encouraged to complete the walk, present your completed passport at Bundall Customer Service Centre during working hours where they can also receive a Commonwealth Walkway Certificate of Achievement signed by the Mayor.